Concerned with how nationalist cultural codes are embedded in everyday life, studies of “nationalism-from-below” mistake nationalist meanings for the contents of official messages. Rather than studying the reception of spectacles and symbols produced from above, the article suggests looking at unofficial nationalism and focusing on the nationalist meanings of traditions and customs—especially those related to ritual and food—that are common to broad strata of the population but have almost no state involvement. Using the anthropological history of Israeli Independence Day as an exemplary case, and focusing on how people spend their country’s national day, the article examines the failure of official nationalism to design the holiday’s popular traditions. Next it surveys the development of what has become the popular mode of celebrating the day—the picnic and cookout. In due course, this practice was ritualized and iconized as representing “Israeliness,” an identity that is more ambivalent than the seamless images circulated from above. I argue that the meanings of unofficial practices, because of their triviality, lie not in the symbolic codes they enact, but rather in the synchronicity that ritualizes and iconizes a “way of life,” forms national solidarity, and imbues the performance with nationalist meanings. I am grateful to Eliezer Ben-Rafael for encouraging me to pursue this project in the first place. I thank my good and supportive friends Nissim Leon, Dafna Hirsch, Danny Kaplan, Nitzan Rothem, Dana Kaplan, Noam Rave, Lenn Schramm, and Nir Keidar for their careful reading and critical and constructive comments on preliminary drafts of this manuscript. Its early drafts were presented at the Section for Culture and Consumption at the Israeli Sociological Association Workshop, 2016; the Annual Retreat of the Scholars’ Forum for the Study of Zionism in Tel-Aviv University, Tel-Hai, 2017; the Center for Cultural Sociology Workshop, Yale University, 2017; and the Haifa Workshop for Performance Studies, 2018. I thank the participants for their feedback and valuable discussions. Special thanks are due to Philip Smith, Shai Dromi, Kazuko Suzuki, Rafi Grosglik, Nir Avieli, David Assaf, Atai Citron, Dorit Yerushalmi, Yoni Furas, Tamir Karkason, and Hila Baharad for highly useful comments and new ideas. 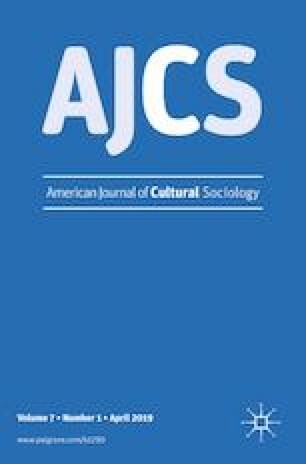 Finally, special thanks to Jeffrey Alexander and the anonymous reviewers of the American Journal of Cultural Sociology for their substantial, pervasive, and most constructive comments on the final version of this article.